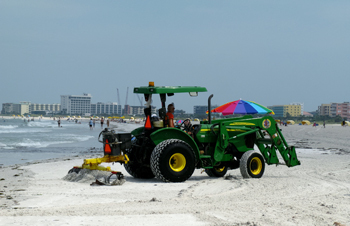 The beach rake is the large green John Deere tractor you see in the mornings on Treasure Island. It gathers the wrack (seaweed) and also tills up the crusty top of the beach renourishment sand. The tractor comes through every other week...unless there has been some bad storms out in the Gulf that have churned up huge amounts of wrack and dropped it on the beach. Believe it or not, there is some controversy about this type of beach maintenance. I never knew so many people had opinions on it. Not only is there resolving arguments for leaving the wrack alone (unless dead marine life has become entangled and washed up) but there has also been anger that the amount of hours/area covered has been reduced to save money in the city budget. Visitors who come to Treasure Island Beach are almost knocked over by the shear width of it. The city bills itself as having the "Widest Beach on the Gulf Coast" and they take that title seriously. That sand, however, is not as Mother Nature created it a few million years ago. It has been "renourished." Erosion and big storms are responsible for the loss of beautiful soft sand Florida beaches are known for. Beach renourishment seems to be the best alternative. 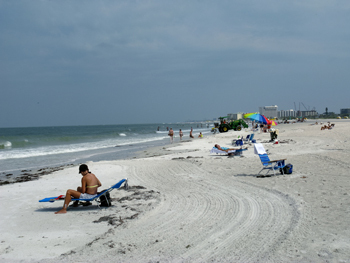 A renourished beach is built by sand sucked up from he bottom of the Gulf of Mexico, then transported by barge and thousands of feet of pipe. As you can see, it is full of shell fragments. It is not nearly as soft as the natural sugary white sand you will find down near the waves. Heavy rains force the great shell content to the top of the sand. 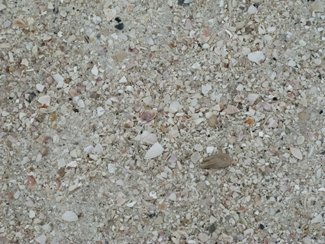 The City of Treasure Island thrives on the tourist trade, so when complaints about shell fragments vs. bare feet come in, they are taken seriously. I've never had a problem walking on this. Most of the fragments are rounded from being kicked around for a few million years. It's not like you're walking on broken beer bottles. Give me a break. 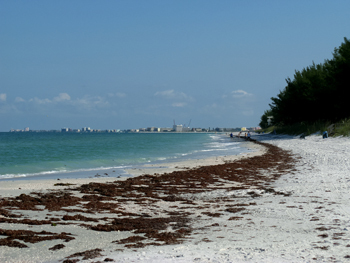 Wrack is the name given to seagrass, marine algae, and reeds that washes up on Florida beaches. A lot of visitors think it is both unsightly and smelly. Actually, it serves a major purpose in the marine ecosystem. The Florida Fish and Wildlife Conservation Commission says shorebirds fly thousands of miles in their migration pattern to stand in the buffet line for these delicacies. Most of the time, wrack is pulled back into the surf. For some reason, this seams to miff a select number of visitors who think Treasure Island Beach should look like the back lot of Disney World instead of a work of Nature. If there has been a big storm, and huge amounts of dead fish and debris wash up on the shore The City of Treasure Island will bring in big dump trucks to haul it off. I can understand this because the tangled mess can easily become a breeding ground for disease with mangled marine life trapped in it. Watching an entire crew of seabirds peck at the carcasses is not the most inspiring sight, either. To me, having the beach rake drag the seaweed back into the surf just gives substance to the Circle of Life. I love watching these guys work in the mornings. 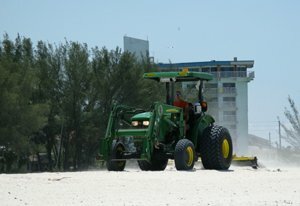 Even though they start pretty early, on summer days when folks get down to Treasure Island Beach before it really starts baking, they have to be pretty nimble with that big tractor. Not only do they have to round up and pull the wrack back into the water, they have to dodge kids fascinated with watching the process and older people who have fallen asleep right in their pathway. Checkout how this guy carved a path between my chair and a lady reading just below me. I figure he was either a revered artist in another life, or had training as a fighter pilot.